Bespoke office interiors firm Penketh Group has brought Frövi to its new Manchester WorkLife Showroom. British furniture company Frövi produce distinctive and colourful furniture using the best craftsmanship and innovation. With a name inspired by Scandinavian design, the brand creates sleek, robust products for the modern workplace. They recently showcased their work at Clerkenwell Design Week in London. 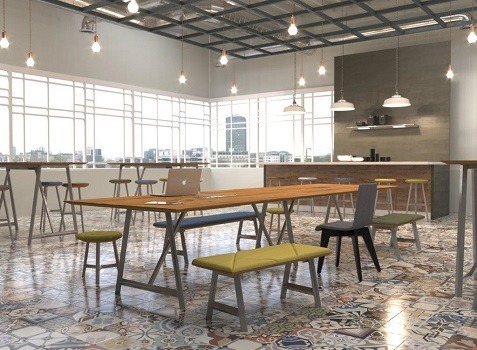 A range of Frövi products are now on show until the end of the year in Penketh Group’s WorkLife Showroom on the eighth floor of Bruntwood’s flagship NEO building in Manchester city centre. Designer Chris Birchall from the Penketh Group, said: “We’re delighted to showcase Frövi into our exclusive designer space in our WorkLife Showroom. Penketh Group was established 40 years ago. They work with clients across the country to create outstanding working environments that engage with and inspire the people who work in them. As well as office interior design and furniture, the company’s services include AV, Technology and Managed Print Solutions.